Election campaigns: Truth-telling or propaganda? In an interview published in the Vanguard of Sunday, October 2, 2016, Prince Tony Momoh, a leading member of the All Progressives Congress (APC), summarised the mood of the nation and the enormous challenges that confronted the government and the citizens. He was responding to a question about the state of the nation and how the government of President Muhammadu Buhari has been wrestling with diverse problems, including security challenges, across the country. Momoh got it right. He understood the situation in the country, crushing poverty, public disappointment with corrupt political leaders and, above all, general cynicism over the country’s future. In this dizzying environment, it is easy to understand why everyone is stressed out. Across the country, many people are struggling economically. They are frustrated by their deteriorating socioeconomic conditions. Other grounds for anger include poor quality of governance, lack of accountability by government officials, persistent lying and propaganda by officials of state, and failure by many state governors to make a difference in the lives of ordinary people. It is a grim situation. Campaigns for the forthcoming elections have not changed the mood of citizens. We must now query the extent to which the ongoing election campaigns have become a platform for truth-telling or propaganda by Buhari, Atiku Abubakar, and other presidential candidates such as Kingsley Moghalu, Donald Duke, Omoyele Sowore, Fela Durotoye, and the rest. Every voter has a right to scrutinise the manifesto of presidential candidates, as well as their campaign promises, their requisite experience, and their track record of achievements. As the date for the first of the elections draws nearer, voters should be asking meaningful, focused, and engaging questions about how the candidates plan to restore law and order by overcoming the Boko Haram insurgency and unrest in other parts of the country. Questions must be asked about how the candidates intend to resuscitate an economy in a state of coma to become the strongest economy in Africa and one of the most vibrant in the world. The performance of some of the candidates at the town hall-style debate has exposed their inadequacies, their inability to answer simple questions, their lack of preparation, and their failure to comprehend the key issues facing the country. The debates must be invigorating because they inform voters about the qualities of the candidates. Election debates help citizens, particularly undecided voters, to make up their minds about the candidates and how they are likely to govern, if elected. The candidates should be quizzed on how they plan to put an end to the persistent embarrassment of the power sector that continues to plunge the nation into darkness rather than provide electricity that is vital to industries, hospitals, businesses, educational institutions, and other essential sectors. Other questions should explore how the candidates plan to transform the agricultural sector and the manufacturing industry to become the leading foreign exchange earners for the country. We cannot rely on oil revenue forever. Voters must ask the candidates questions about how they plan to improve decrepit infrastructure. The candidates must outline their agenda to fight corruption in light of the prevailing culture of sleaze that encourages senior public officials to ask for kickbacks for every service they render to their fatherland. Also to be included in the basket of questions for presidential candidates are how they intend to fund university education that has suffered a sharp drop in quality of teaching and research, how they plan to revive our dilapidated public hospital system that has turned into a mortuary for sick people, and how they plan to overturn the negative image of the country in the international community. These questions and more should engage the time and attention of the presidential candidates. Another area that should be strictly enforced as the election campaigns and debates begin to wind down is the use of respectful language by all candidates during campaigns. Political parties should encourage the use of responsible language by their candidates during campaigns. We degrade the language and quality of election campaigns if politicians are allowed to use indecorous language to belittle their opponents. Every candidate must weigh their words carefully. Politicians seem to excel in the use of ill-mannered and uncouth language during election. Candidates who adopt crude language to demonise their opponents would have exposed their lack of political sophistication and small-mindedness. The essence of subjecting the candidates to robust debates ahead of this year’s elections is to reduce or eliminate the kind of misleading promises of change made in 2015 that got the current government over the line during the elections. As the APC was not scrutinised vigorously during the 2015 election campaigns, we are now experiencing the dire consequences of that oversight. For the past four years, we lived with a government that promised to transform people’s lives but did not blink or feel mortified to explain why it failed to fulfil some of the promises it made to the nation. In 2015, the APC introduced the “change” mantra that it argued would transform the country into that legendary place of inestimable wealth. We were promised that government would wipe out corruption, destroy the Boko Haram insurgency in various parts of the North-East, and curb restlessness by other ethnic minorities, particularly in the Niger Delta. Voters believed promises that unsteady supply of electricity would be overcome within months of the APC coming into office. The party also promised to reduce youth unemployment almost to zero, and assured the nation that everyone would experience a more equitable and stable society brimming with happy people. Four years on, all the promises remain on the threshold of fiction. Many Nigerians talk angrily and openly that their conditions are no better now than they were more than four years ago. Poverty has strangulated many citizens, including elderly pensioners who cannot get their hands on their entitlements. Some of them died while facing long and ridiculously complicated processes designed to frustrate and deny them access to their pension. Redemption is nowhere near the reach of anyone. 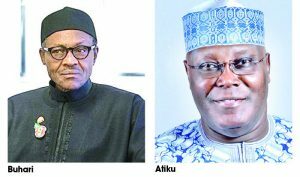 Prior to the election of the current federal government, there was so much propaganda and charm constructed around the persona of the leading presidential candidate who was offered to voters as the man who would save Nigeria from 16 years of hardship under the government led by the People’s Democratic Party (PDP). What a difference four years have made to voters’ psyche. A few years ago, someone described Nigeria as “a work-in-progress.” That portrayal, even though offensive, still captures the disorderliness that underlines the way the country is being governed. It is regrettable that Nigeria should be represented in such an uncomplimentary way. Perhaps the description is appropriate when you consider all the social, political, economic, cultural, and technological challenges that confront the country and the way they are being dealt with.